The best news from the German national elections of Sept. 24 was that the main parties of German imperialism — the Social Democrats (SPD) and the Christian Democratic Union with its Bavarian Christian Social Union ally — had their worst results since World War II. The SPD got only 20.5 percent and the CDU/CSU 32.9 percent. These parties, which have dominated the German government since post-war West Germany was stabilized, together got barely more than half the votes. The worst news was that the ultra-right wing, anti-immigrant and anti-Muslim party, the Alternative for Germany (AfD), came in third, with 12.6 percent of the votes. For the first time the AfD, founded in 2013, won seats in the Federal Parliament, or Bundestag. Political observer Victor Grossman aptly describes the AfD, which has drawn together leaders from various racist and neo-fascist parties, as divided between “far right racists and extreme right racists” in his Berlin Bulletin of Sept. 25. The AfD won 94 of the 709 seats in the Bundestag, which will give these ultra-rightists even more media coverage to spew their racist viewpoint. 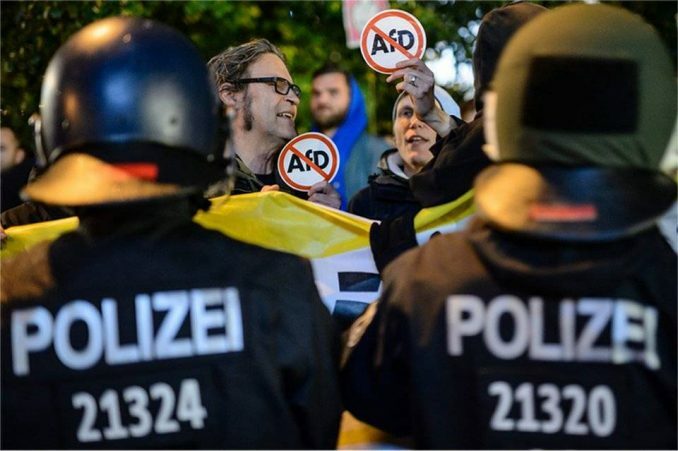 The AfD advance should not, however, prevent existing left forces in Germany from continuing their courageous activities, which include confronting the racists and neo-Nazis wherever they raise their heads, protesting at U.S. military bases, denouncing German participation in wars abroad and supporting workers who go on strike. The electoral results fit a general pattern in many European countries. Instability in the capitalist economy, coupled with an “austerity” program that cuts wages, benefits and jobs, creates general dissatisfaction among the population. Workers’ living standards decline, and insecurity grows, even in the more prosperous countries. Mostly NATO members, these countries’ imperialist ruling classes also take part in wars and war maneuvers, from the borders of Russia to the mountains of Afghanistan. They sow misery throughout North Africa and Western Asia, driving millions to leave these regions and head toward Europe for survival. 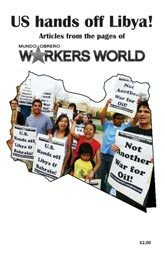 The capitalist, pro-imperialist parties that have run these governments for decades offer no solutions for the workers. Right-wing parties arise that offer false solutions. They scapegoat refugees, immigrants and especially Muslims, blaming the victims for the evils of decadent capitalism. While none of these ultra-right or neo-fascist parties has taken control of a government in Western Europe, they still represent a threat. The National Front in France received a third of votes there, and parties analogous to the AfD exist in Austria, Belgium, the Netherlands, Italy and the Scandinavian countries. In addition, they pressure the center-right and formerly social-democratic parties to move to the right and parrot their racism. The racist and xenophobic Donald Trump electoral victory in the United States fits this pattern. In Germany the CDU/CSU still came in first, with 246 seats, despite finishing with such a small plurality. The SPD won 153 seats. Angela Merkel, who has been chancellor since 2005, still has the task of forming and leading the next government. Three other parties won seats. The Free Democrats (FDP), a bourgeois party that had lost all its seats in the 2013 election, came in fourth, winning 80 seats. The Left Party — the only party that has been anti-war and shown solidarity with immigrants — is fifth, with 69 seats. And the Green Party, which can no longer be considered leftist, but still takes positions defending the environment, won 63 seats. The last German government was a so-called Grand Coalition of the CDU/CSU together with the SPD. This time SPD leader Martin Schulz has announced that his party will not join such a coalition, but will instead lead the opposition. That means it will be a serious parliamentary problem for Merkel to form a new government. Merkel will have to join two diverse partners with her own parties. The most likely coalition would be between the CDU/CSU, the FDP and the Greens. As of now an alliance of any party with the racist AfD is taboo. The CDU/CSU also refuses to allow The Left Party into the government. Being part of a government coalition would, in any case, force The Left Party to surrender its up-to-now consistent anti-war and anti-NATO positions and compromise its defense of workers’ rights. Joining such a government might only discredit this party as a pole of opposition to the imperialist regime. But such discrediting has occurred where The Left Party joined local government coalitions.